A smiling young woman, Jennifer Carprio, received a life-changing award, Barbara Flores, SCN, presented her with a scholarship, as her grade school principal, one of many advocates in her life, stood by. 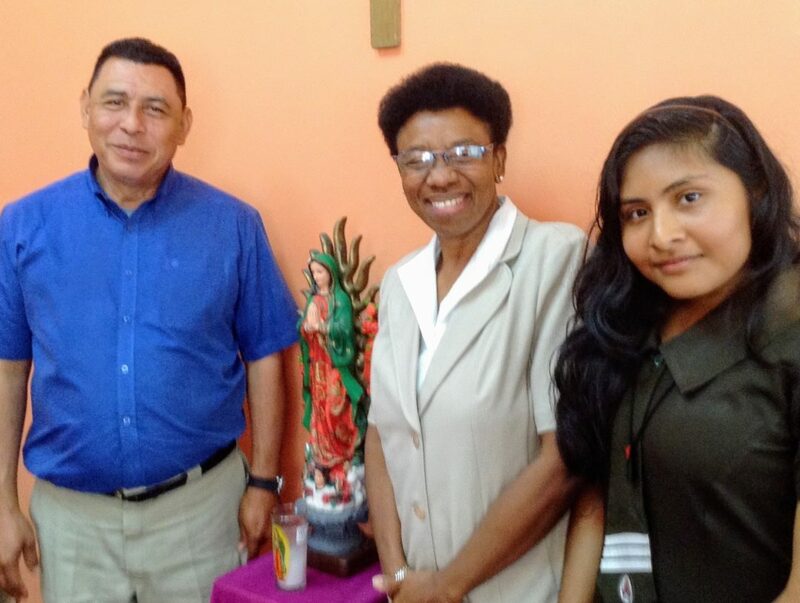 Jennifer, a young woman in Belize, received the scholarship to attend high school from the Sisters of Charity of Nazareth. Without this award, her education would have likely ended after grade school. In 2012, the Sisters established a Scholarship Fund in honor of the 200th anniversary of the Congregation. Contributions to the fund allowed the Sisters to offer tuition assistance to girls and young women who otherwise would not have a chance to receive an education. Scholarships were awarded in India, Nepal, Belize and the United States. In Belize, although elementary school is free and compulsory until age 14, a high school education costs about $1,000 Belizean dollars a year, or the equivalent of $500 in the United States. Jennifer’s family, who struggles financially, decided that, with a lot of effort, perhaps they could send one child, a son, to high school. There would not be enough money to send Jennifer. Thanks to her grade-school principal, who recognized the young girl’s potential, and to the SCN Bicentennial Scholarship Fund, Jennifer, like her brother, now attends high school. She is an excellent student with a very high grade-point average. Jennifer keeps in touch with the Sisters and shares her report cards. Sisters can’t wait to see where the future takes Jennifer. They are touched by the young woman, her gratefulness, drive, and dreams. “She is so excited about the opportunity for an education and always expresses deep gratitude,” reflects Sister Barbara. Jennifer, always follow your dreams! The support and pride of your family, friends and the SCN Community are with you. God bless you! Way to go Jennifer, we are so proud of you!